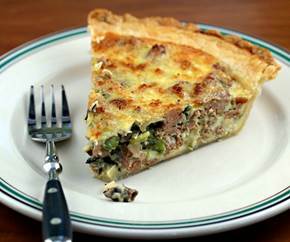 Fry-scramble sausage until done and drain, put ½ sausage and ½ of the cheese in each pie shell. Combine remainder of ingredients in a bowl and pour over sausage and cheese. Bake at 350° F for 40-45 minutes or until browned and set in middle.